Sometimes I wonder how many recipes are born out of sheer desperation. There were some mediocre meals that came out of those moments, probably some culinary disasters too, but there were definitely also some dishes of pure genius. I mean Ruth Wakefield thought the semi-sweet chocolate pieces she added to her butter cookies would melt, but they didn't. And the chocolate chip cookie was born. This salad feels like a similar sort of revelation. The pita bread going stale on the counter that I almost thew away. The almost overripe tomatoes and avocados from our Saturday morning farmer's market visit. The last bits of garlic and drips of olive oil in my kitchen. Providential mistake or stroke of genius, this is a salad that I will be making again and again. 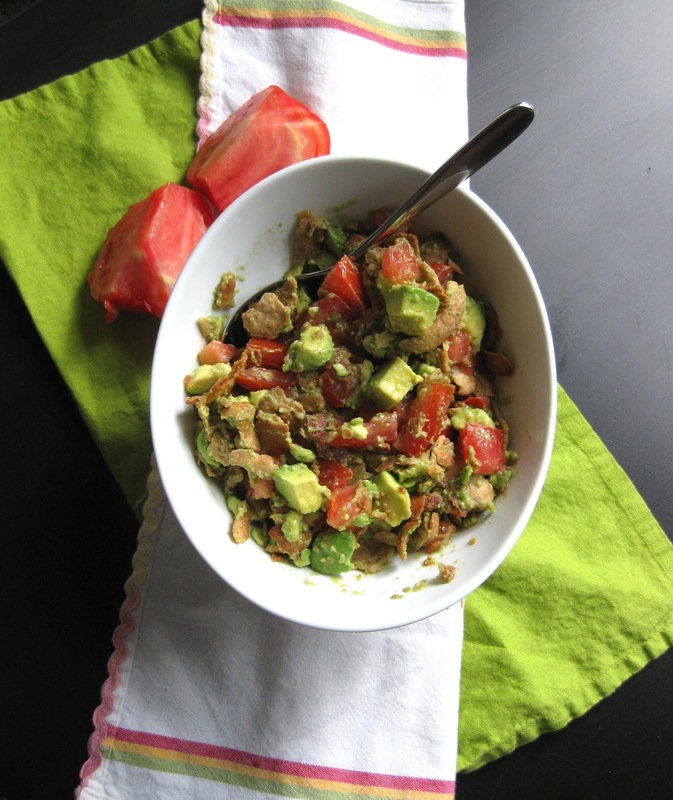 I've always loved tomato and avocado together, but the cripsy garlicky pita chips elevate this to serious crave-worthy-mealtime. Besides lemon juice, olive oil, and salt & pepper, the only ingredients are the ones you see below, and the whole things comes together in the 7 minutes it takes you to toast the pita bread. As you noticed over the weekend, I have a thing for carbohydrates in my salads, and this is no exception. This salad would be perfect for lunch at work or a spring picnic outside, but if you're making it in advance, keep the pita chips separate and add them right before serving. They will get soggy if they sit for more than a couple hours. Also, Adam suggested adding bacon to this salad (surprise, surprise) which would most likely be crazy delicious as well. Go scrounge up some questionable ingredients in your kitchen and experiment! Then make this salad. Rip pita bread into bite-sized pieces and then scatter across a large cookie sheet. Sprinkle with minced garlic and drizzle with olive oil. Use your hands to evenly distribute the oil and garlic all over the pita pieces. Bake for 7-8 minutes, stirring once to prevent burning. Meanwhile, cut up avocados and tomatoes and put in large bowl. Sprinkle liberally with salt and pepper and pour in lemon juice. Remove pita bread from the oven. If serving immediately, add to the salad. Otherwise, refrigerate tomato/avocado mixture and add pita right before serving. Once added, the pita bread will stay crisp for about 2 hours. Yum! I bet I can make that with some flax seed crackers/ bread too! Baked Blueberry Oatmeal with Lemon "Cream"